Q: Do you deliver to other cities outside of the listed areas? A: We generally stay within our listed areas however we can consider delivery outside for large orders. Please call or email our office for a current quote. A: No. We arrive before your party to set up so you get the entire rental time to play. A: No. The jump should be clean when you get it. 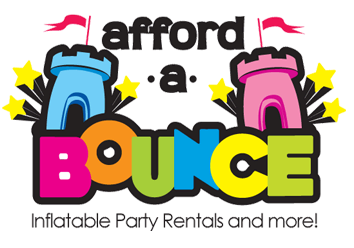 Afford-a-Bounce Dallas cleans and sanitizes after every rental. A: Yes. A blower keeps air in the jump unit the entire time. Once unplugged they deflate. That's why we require an outlet within 65 ft. of the unit or a generator. Longer cords can pop your circuit breaker so we bring our own heavy duty cords. DO NOT plug other items into the same circuit breaker otherwise the power will weaken and so will the blower. A: We love setting up at parks but most parks do NOT have electricity. If you want to set up at a park, you must rent a generator. We rent generators at a reasonable cost. Also, parks are first come, first serve so get your spot early in the day. If you rent a park pavillion that has electrical outlets please make sure they work prior to renting a bounce house. A: We require a credit card as a non-refundable deposit. If paying by cash for the remaining balance, please have exact change as our drivers do not carry change. A: Deposits are non-refundable unless you need to cancel due to inclement weather scheduled on the date of your event such as a 40%+ chance of rain forecast or temperatures under 50 degrees fahrenheit. Customers must call us prior to delivery or customer pick-up to cancel and recieve a refund or rain check. Rain can be scattered so please keep in mind that although it might be raining in your area it can be dry where we are. However, if you were to call 3 days (72 hours) before your event to cancel and it's not due to wether, you will be liable for the remaining balance. A: Yes all orders require a $25 Credit Card deposit in order to guarantee your order. A: Most of our jumps (all of our character jumps for example) are 15 ft.x15 ft. which is a little bigger than many companies rent. 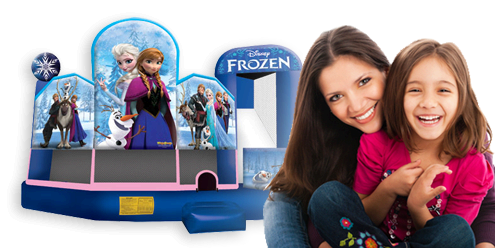 Some are also13 ft x 13 ft. for smaller set-up areas. Please note the space required for each jump (listed near the large picture) as some are VERY big and require extra space. When in doubt, measure your space to make sure it will fit. Jumps need room to be staked/sandbagged and they need room for the blower and can't rub against walls or trees as this may damage the jump. The sizes listed with each jump include the space needed for stakes etc. A: Check the requirements listed with each jump. Also, make sure you have at least a 4 ft wide access including gates to the area where it will be set up. The jumps can weigh up to 650 pounds so we need a clear path with ample room. Dunk Tanks need at least a 6 ft wide access path and gate.